We have been learning lots of new Christmas songs as part of our preparations for our Christmas performance. Now that it has finished, we have started to think about traditional carols. We looked at Away in a Manger and thought about what the words mean. What is a manger? Why was there a manger in a stable? Why didn’t Jesus lay in a cot or a cradle (crib)? We talked about what type of song it was and how it made us feel before looking at musical instruments. We investigated dynamics using the instruments before deciding what the most appropriate way to play them would be. We found that most instruments could be played softly or loudly and that the dynamic which matched the song best was softly. We then found the pulse of the music before playing our instruments thinking about both the pulse and the dynamics. We were very lucky to have taken part in a drum workshop in March. 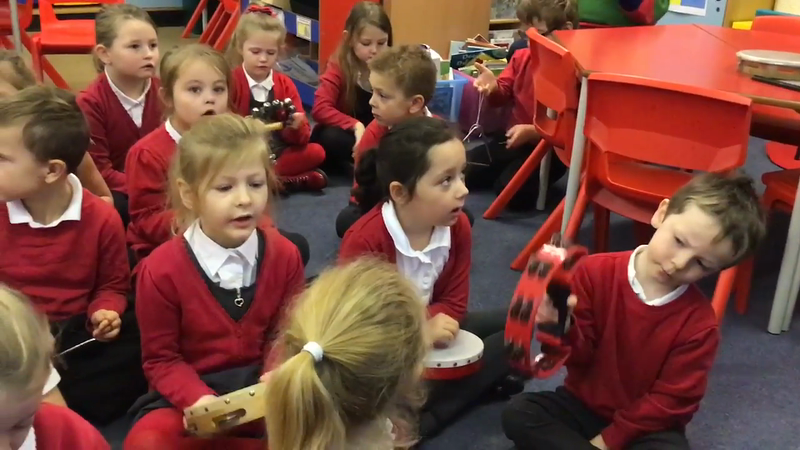 We used a variety of percussion instruments and played music related to our topic and the book we have been reading in our Guided Reading lessons - Rosie Revere, Engineer!